Over time, common wear and tear due to everyday use and weather conditions occurs for even the most well-kept exterior doors. Worn-down exterior doors lead to drafts, energy waste, and expensive utility bills. In order to save money and energy and keep your home snug, it's important to consider exterior door replacement for your home. Window replacement, exterior door replacement, and garage door replacement can make a big impact on your home's energy efficiency, especially if you choose particularly energy efficient materials. Read on to learn more about the price of exterior door replacement. Steel: Steel and other metal exterior door materials can provide endurance and strength with a reasonable price tag. A polyurethane core boosts insulation, helping a steel exterior door act as a thermal barrier. With a wood-cladding finish, your steel door can mimic traditional wood. Aluminum: While steel is unfortunately prone to errant dents or dings, metals like aluminum are more durable. Aluminum doors are often used for homes in hurricane-prone areas. Generally speaking, metal doors such as steel or aluminum have R-values (a measurement of thermal resistance) ranging between R-5 and R-6. 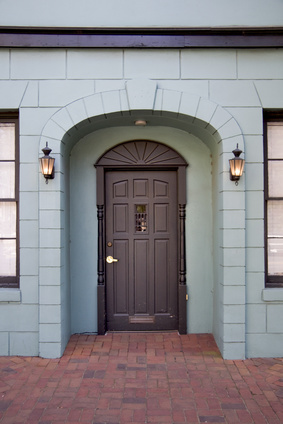 Fiberglass: This newer material makes for a high-performance door and is a good choice for an exterior door replacement. Fiberglass is virtually maintenance-free and resistant to denting, warping, or rot. Today, innovations allow fiberglass to mimic popular woods like mahogany or to be finished with various colors and stains. While most fiberglass doors have an R-value between R-5 and R-6, additional insulation and weatherstripping can raise this value. Wood: For those seeking the traditional beauty of a wood door, there are many different types of wood to choose from, including walnut, cherry, and mahogany. In harsh or humid climates, wood doors can be highly susceptible to warping or rot from too much exposure to sunlight or moisture. However, protective paints or glazes can help homeowners preserve their investment, as a wood exterior door replacement can be quite expensive. Homeowners should expect most wood doors to have R-values from R-1 to R-3. Homeowners may want to take the time to spruce up their entryway. Consider double doors, sidelights on either side of your door, transom windows above the door, or glass panels. Your exterior door replacement can feature no glass, all-glass, or a few decorative glass panels. Many manufacturers offer customized glass designs for your exterior door replacement. The prices for an exterior door replacement depends on materials and options. Prices start around $150 for basic six-panel doors and can be as much as $3,500 for high-performance doors with quality materials and elaborate glass inserts. Traditional woods typically range from $200 for basic models to upwards of $2,000 for popular styles like mahogany. Alternatives like steel or fiberglass range from $250 to $900 or more. Expect to pay around $300 for professional installation for your exterior door replacement. New exterior door replacements come with many benefits, from cutting energy waste to improving curb appeal. It's important to hire a home improvement professional to ensure that your exterior door replacement is completed correctly and in a timely manner. Professional installation can prevent costly problems that occur with incorrect installation in the future. Check out HomeAdvancement's database of local, quality contractors to start your exterior door replacement today.